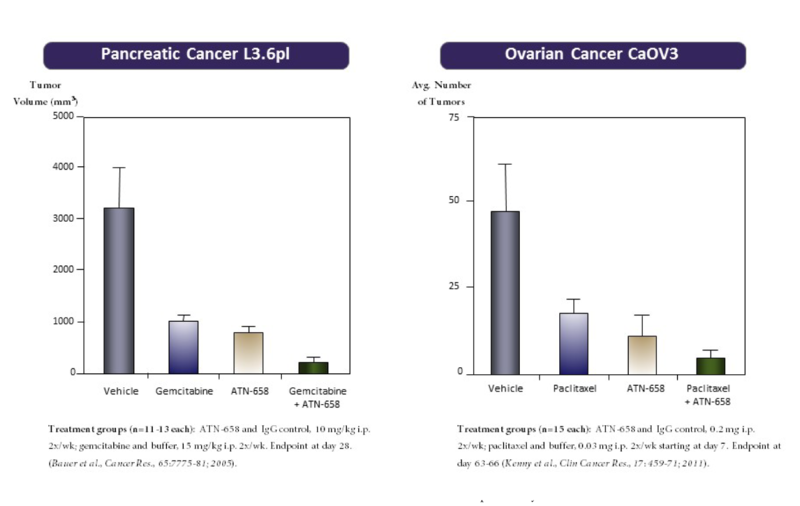 MNPR-101 :: Monopar Therapeutics Inc.
MNPR-101, demonstrated significant anti-tumor activity in numerous preclinical models of tumor growth and is being advanced for clinical evaluation. Based on the selective expression of uPAR in tumor, MNPR-101 is expected to be well-tolerated and amenable to a variety of combination treatment approaches. 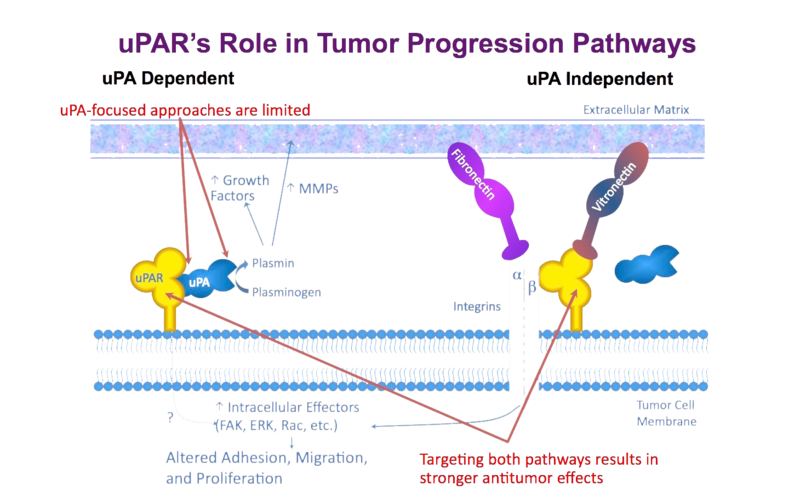 MNPR-101 is designed to interrupt several pathways required for tumor growth and progression. The compound's mechanism of action is designed to block several particular cellular activities that are only turned "on" in a tumor rather than to destroy the tumor cell directly. For this reason, Monopar believes that MNPR-101 may have fewer side effects than current cytotoxic agents which kill cells indiscriminately. In addition, by inhibiting multiple pathways required for tumor growth and progression, MNPR-101 may lead to more effective tumor control than therapies that target only a single such pathway. Monopar believes that most tumors, regardless of the tissue from which they originate, rely on the pathways that Monopar is targeting; therefore, therapies directed at such pathways have the potential to be used against many different types of cancers. MNPR-101 may also avoid some of the drug resistance problems caused by genetic instability that plague many conventional chemotherapies. Cancerous cells mutate and reproduce rapidly, meaning that there is great genetic heterogeneity among cells in a tumor. A given chemotherapy may be effective against the vast majority of these cells, but if even a small number have mutations that confer resistance, these cells will likely survive the treatment. The tumor will grow back composed almost entirely of these mutated cells, making the cancer resistant to further treatments with that particular chemotherapy. By targeting multiple tumor progression pathways, using drugs in combination regimens, and targeting more genetically stable endothelial and immune cells in addition to tumor cells, Monopar believes that MNPR-101 has the potential to avoid these drug resistance problems. MNPR-101 is not expected to replace existing therapies, but rather to complement them. MNPR-101 is intended to be combined with existing therapies used to reduce tumor mass in order to make the overall treatment more effective in the acute setting. MNPR-101 could make chemotherapy more effective by making tumors more susceptible to chemotherapy by interrupting the tumors' protective mechanisms. MNPR-101 could also potentially be used as a standard follow-up therapy after chemotherapy to prevent tumor regrowth and metastasis or in combination with immunotherapy including immune checkpoint inhibitors. Many cancers are not fatal unless tumors metastasize beyond their primary site and interfere with normal function in critical organs of the body. Current thinking suggests that by containing or preventing tumor growth, it may be possible to transform cancer into a manageable, non-fatal condition treated with chronic drug therapy. Given these potential uses, new treatments that target multiple pathways and are designed to be used in drug combinations, like MNPR-101, have the potential to significantly improve treatment outcomes, rather than merely competing with each other in the market. © 2019 Monopar Therapeutics Inc. All Rights Reserved.